If initial sales figures for the iPhone 4S are any indication, Apple could issue a resounding “I told you so” to critics who initially panned the phone’s new features and unchanged physical appearance as disappointing. Perhaps even more telling: Solid sales of older iPhone models continue to prove Apple’s dominance in the smartphone space. The iPhone 4S sold over one million pre-order units in its first 24 hours of availability, trouncing previous record pre-order sales of 600,000 units for Apple’s iPhone 4. Early iPhone 4S purchasers are likely a mix of 3G and 3GS owners who qualify for an upgrade, those who just want Apple’s latest and greatest, and those unable to previously get access to the iPhone on their network, says Forrester analyst Charles Golvin. “It reinforces [Apple's] belief in their strategy, building the products that they think make the most sense,” Golvin says. The iPhone 4S shares its form factor with the iPhone 4, but features some dramatically revamped innards. These include an 8-megapixel camera with a faster shutter speed and backside-illuminated sensor, a voice-activated digital assistant called Siri that could revolutionize the way we interact with mobile devices, and a hot new A5 processor that provides up to 7x faster graphics processing. A video leak shows that the Safari browser is about twice as fast on the iPhone 4S than on the iPhone 4. 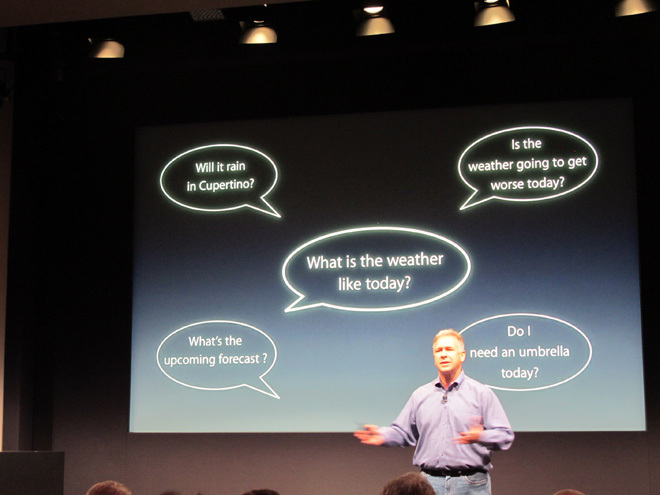 One of the most revolutionary new features is Siri, a natural language voice-control tool. You can ask Siri questions, and “she” will pull data from websites, your calendar, or Wolfram Alpha, a dynamic search engine that uses linguistic analysis or advanced computations to provide information. For example, if you say, “Define mitosis,” she’ll provide the definition from Wolfram Alpha. If you say, “Find me a great Greek restaurant in Palo Alto,” Siri responds with “I’ve found 14 Greek restaurants, five of them are in Palo Alto. I’ve sorted them by rating.” You can also use Siri to find out information about your daily schedule, dictate emails and text messages. Siri will translate your dictation to text, and then dispatch your communiques. All in plain English. Or German and French. “Apple’s new Siri Assistant is a powerful harbinger of the future use of mobile devices,” Golvin said in a statement. Norman Winarsky, co-founder and board member of Siri prior to its purchase by Apple in 2010, thinks that Siri is a paradigm-shifting innovation. “This is a first. This is real technology, with real artificial intelligence. It’s a do engine, not a search engine,” he says. This is just the beginning of the era of virtual personal assistants, Winarsky says. Imagine calling an airline to make a reservation. Instead of suffering through a series of menus — misdialing or having a bot misinterpret your commands — you could call the airline, voice your exact request, and be quickly transferred to the right representative. Or you might even bypass the representative altogether. For example, saying something like, “I would like to make a reservation for the cheapest flight before noon on Oct. 14? would automatically present you with relevant options. With the introduction of the iPhone 4S, Apple now has a full product portfolio, from the shiny new iPhone 4S to the budget-friendly free 3GS. And despite their “old age” (well, in smartphone years), the iPhone 4 and 3GS continue to dominate carrier sales charts. For June through August of this year, the iPhone 4 and the iPhone 3GS were the number one and number two selling smartphones, respectively, on AT&T, while the iPhone 4 was the top seller on Verizon (which does not carry the 3GS). Given their reduced prices, the iPhone 4 and 3GS will likely continue to deliver solid sales numbers, despite the fact that they’ve been eclipsed by the 4S. “I believe that Apple’s iPhone sales will continue to grow significantly, and not just due to the 4S, but because now there’s an iPhone for anyone, no matter what they can afford to spend,” said Golvin via email. Sixty percent of cellphone owners still use feature phones, so providing a cost-effective, entry-level option for consumers puts Apple in a strong position to gain wider adoption. Indeed, Apple has its ducks in a row, and seems poised to realize killer market-share figures over the next few months as consumers gobble up its handsets. The ball is in the Apple critics’ court.